Each year, foundations and generous individuals provide millions of dollars of support for nonprofit organizations that strengthen the lives of Maine residents and their communities. As part of the Maine Philanthropy Center’s commitment to promote and advance the effectiveness of philanthropy in Maine, we have collected and analyzed the most recent data available to provide a snapshot of giving in Maine. 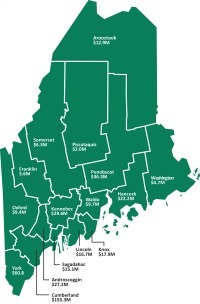 The 2016 Giving in Maine - Individual Report reflects data from 2013, and includes information on charitable deductions, volunteering, and bequests.